When Monsignor Valenzano first opened the adoration chapel in 2011 at the Basilica of the National Shrine of the Assumption of the Blessed Virgin Mary, Wandishin was among the many people who signed up to pray holy hours there. So many people committed to prayer, in fact, that the undercroft chapel was open 40 hours a week, Monday through Friday. Over time, however, the number of people who kept their holy hours dropped substantially. Since there must always be someone present with the Blessed Sacrament when it is exposed for prayer, the chapel was forced to cut back its hours. Today, it is only open Tuesdays and Wednesdays. Many people, including Wandishin, blamed the drift on not having enough time or getting too swamped with life’s challenges. Wandishin, who coordinates adoration scheduling at the basilica, recently renewed her commitment to holy hours. She is encouraging others to do the same. Her goal is to get enough people to sign up so the basilica chapel can be open Monday through Thursday by Sept. 5, the first anniversary of Monsignor Valenzano’s death. I can’t think of a better tribute to one of the holiest people I’ve met. No one was more enthusiastic about eucharistic adoration than Monsignor Valenzano. The universally-loved priest usually began his day by making an early-morning holy hour. 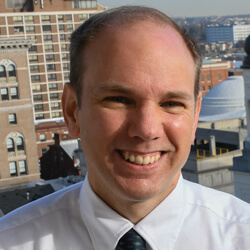 Long before the priest established the basilica’s adoration chapel, he opened a perpetual adoration chapel in 2002 at St. John in Westminster, where he had been pastor. Agnes Geraghty, who helps coordinate scheduling at St. John’s chapel, said it has remained open 24 hours a day, 7 days a week since its inception – except for a handful of closings related to blizzards or campus construction. With the help of a generous donor, the basilica’s adoration chapel was beautifully refurbished in 2014. 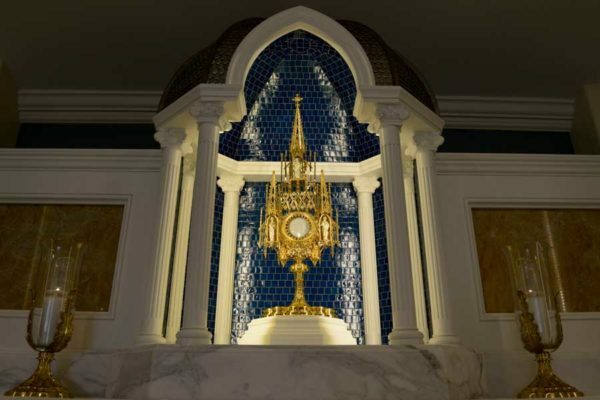 It features an unlikely monstrance – one mysteriously plucked from the Loch Raven Reservoir by a fisherman many years ago and donated to the archdiocese. Archbishop William E. Lori dedicated the basilica chapel in Monsignor Valenzano’s honor 10 months before the priest died. The adoration chapel in Westminster was posthumously dedicated in his honor on Father’s Day this year. Those who pray in adoration don’t tend to pray for themselves, he said. They pray for the needs of others. It’s an opportunity for us to communicate silently with God, he said – as God communicates silently with us. Starting this month, I will make a weekly holy hour at the basilica. Will you join me? For information about committing to a weekly hour of adoration at the basilica, email kwandishin@baltimorebasilica.org or call 410-727-3565, ext. 204. George Matysek offered this reflection on the life of Monsignor Valenzano following the rector’s death last year. Also read coverage of the priest’s funeral here.